In the digital age where more and more of our shopping and general transactions is starting to take place online, the system of deliveries through which we get things done is bound to change as well. If we do more online shopping, it’s also inevitable that the companies shipping the online products to us will also shift from traditional delivery systems towards a more online-oriented one, such as Google Express delivery. Of course that there isn’t anything outdated or dysfunctional about major firms such as DHL or FedEx that still ship and deliver a huge proportion of all online transactions, but all we’re arguing is that a delivery service better tailored to the specific online environment is better equipped to handle this business. Whether or not the major mail delivery and logistics service providers will be able to adapt in the following years and continue to dominate the market remains to be seen. But one thing is clear: no matter what the competition posed by these firms will do in the end, it’s clear that the Google Express Delivery service is already tailored to the online market and will continue to rise. Formerly known as Google Shopping Express, the service started out as a same-day delivery for online shopped goods, but the rate of deliveries eventually slowed down to a next-day basis as the service expanded. Initially, it was launched in 2013 only for the San Francisco and the Silicon Valley areas, as a test drive, and faster times were therefore more feasible if the geographical area of activities were also more restrictive. But even if for now Google’s express delivery services were a bit slowed down to a next-day delivery time of completion, it’s still competitive enough on the market. None of the other mail services can boast better rates, and Google Express delivery is still better connected to some of the major shopping hubs in the online world. Initially, creating an account for the Google Express delivery service was free for subscribers for the first 6 months since the launch, in order to encourage more people to join. Then, after the service started charging the expected fee from its customers, the pleasant surprise was that this fee is still a bit lower than the one practiced by the major competitor, Amazon Prime, with no major difference in service quality. Using a fleet of cars and sometimes even bicycles and on-foot couriers for some areas, the Google Express delivery service meets its deadlines and just keeps coming with our online orders, so far in a reasonably flawless manner. So, if you decide to try out the service for yourself, first you need to create an account and then select Google Express delivery at your next online shopping order. You will also receive a tracking code (much like when using any other competing mail service), and you can expect a delivery person to knock on your door the next day, delivering your order. In highly exceptional situations, since the service is very popular, there aren’t any next-day slots available for delivery, and the arrival of your order will be delayed by a day, but you will be made aware of that from the beginning. Still, rest assured in the vast majority of cases, the Google Express delivery times are overnight or even on the same day, and it’s very likely to keep improving further as they gain a foothold in the niche. 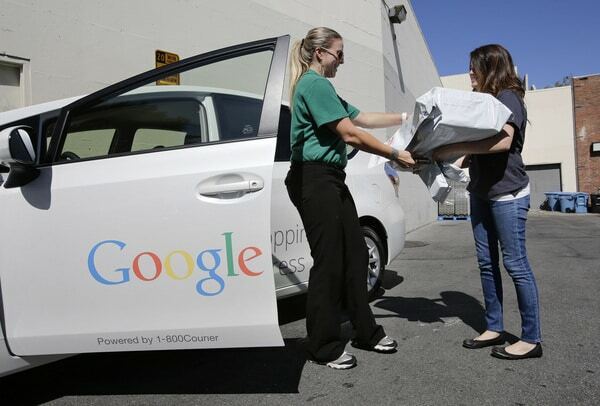 Hey Buddy!, I found this information for you: "Google Express Delivery: How It Started & How It Works". Here is the website link: https://all2door.com/google-express-delivery/. Thank you.